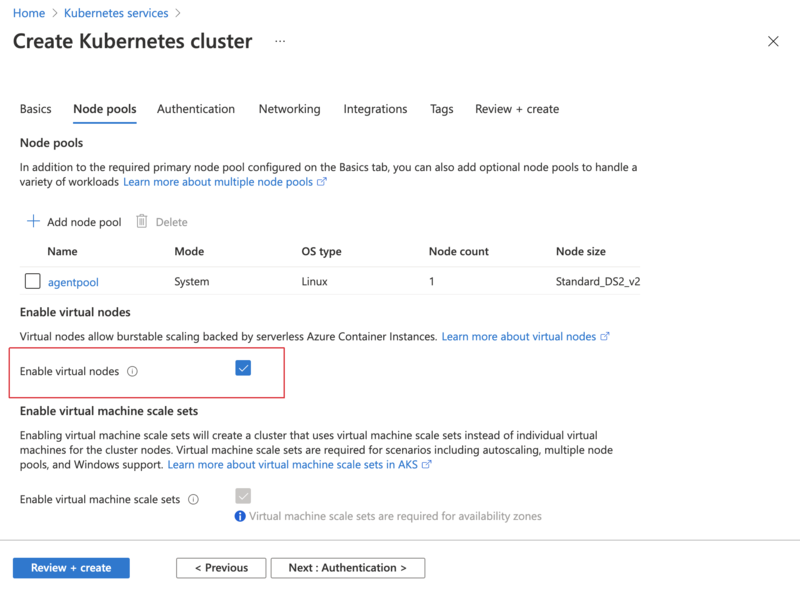 To quickly deploy workloads in an Azure Kubernetes Service (AKS) cluster, you can use virtual nodes. With virtual nodes, you have fast provisioning of pods, and only pay per second for their execution time. In a scaling scenario, you don't need to wait for the Kubernetes cluster autoscaler to deploy VM compute nodes to run the additional pods. This article shows you how to create and configure the virtual network resources and an AKS cluster with virtual nodes enabled. In the top left-hand corner of the Azure portal, select Create a resource > Kubernetes Service. Select the number of nodes to deploy into the cluster. For this article, set Node count to 1. Node count can be adjusted after the cluster has been deployed. Under Virtual nodes, select Enabled. By default, an Azure Active Directory service principal is created. This service principal is used for cluster communication and integration with other Azure services. The cluster is also configured for advanced networking. The virtual nodes are configured to use their own Azure virtual network subnet. This subnet has delegated permissions to connect Azure resources between the AKS cluster. If you don't already have delegated subnet, the Azure portal creates and configures the Azure virtual network and subnet for use with the virtual nodes. Select Review + create. After the validation is complete, select Create. It takes a few minutes to create the AKS cluster and to be ready for use. The Azure Cloud Shell is a free interactive shell that you can use to run the steps in this article. It has common Azure tools preinstalled and configured to use with your account. To manage a Kubernetes cluster, use kubectl, the Kubernetes command-line client. The kubectl client is pre-installed in the Azure Cloud Shell. In the Azure Cloud Shell, create a file named virtual-node.yaml and copy in the following YAML. To schedule the container on the node, a nodeSelector and toleration are defined. These settings allow the pod to be scheduled on the virtual node and confirm that the feature is successfully enabled. Use the kubectl get pods command with the -o wide argument to output a list of pods and the scheduled node. Notice that the virtual-node-helloworld pod has been scheduled on the virtual-node-linux node.